Despite having a career spanning almost 30 years rock band Bon Jovi are not prepared to rest on their laurels. 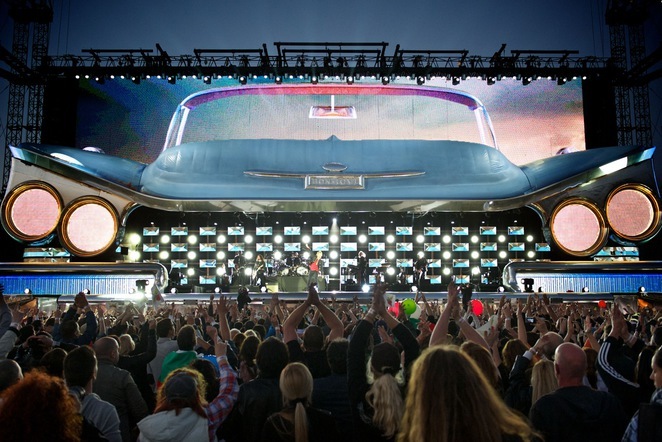 Their latest world tour boasts a spectacular stage in the shape of a 1959 Buick Electra and a show clocking in at almost three hours. But they are still confident enough to open the gig with a new song, That's What The Water Made Me, from latest album, What About Now. It didn't quite have everybody singing along so that was quickly remedied with a triple whammy of fan favourites, You Give Love A Bad Name, Born To Be My Baby and Raise Your Hands. With his Captain America-style stars and stripes jacket and his toothpaste-white smile 51-year-old Jon Bon Jovi revelled in the adulation as he stood at the front of the stage - but he was like a lone Avenger. Trusty sidekick, guitarist Richie Sambora, has decided to sit-out this leg of the tour, his place taken by Phil 'Phil X' Xenidis. Although lacking the cool factor enjoyed by Richie Phil quickly won over the stadium crowd with some classy guitar licks. He was particularly impressive during Keep The Faith as he traded riffs with keyboardist David Bryan. After an hour, as the sun dipped and the temperature dropped, Jon slowed the tempo with another song from What About Now, the gospel-tinged ballad, Amen, which showed he's lost none of his vocal prowess. Another rock ballad, Bed Of Roses, followed, then he announced it was 'time to turn up the heat' and powered into Captain Crash & The Beauty Queen From Mars which had the whole stadium bouncing. A great version of John Fogerty's Rockin' All Over The World, popularised by Status Quo of course, was thrown into the mix before I'll Sleep When I'm Dead and Bad Medicine, including segments of Old Time Rock & Roll, closed the main part of the show. Those who left before the encore made a big mistake because still in store was around another hour of music. The band returned to the stage for Dry County and Wanted Dead Or Alive during which Jon requested all mobile phones be held aloft, making the stadium look like a starry night. For In These Arms the singer moved to a semi-circular walkway extending into the crowd, enabling him to high-five fans. The encore continued with Happy Now, Have A Nice Day and the massive 1986 hit Livin' On A Prayer. It was all over – or was it? The band hesitated as they exited the stage, then turned round and returned for another two numbers, Always and Blood On Blood. Another winning performance at Villa Park! Bon Jovi's Because We Can tour continued at Cardiff City Stadium on June 12 and will move to Sunderland's Stadium of Light on June 13, the Isle of Wight Festival on June 16, Glasgow's Hampden Park on July 3 and London's Hyde Park on July 5. Bon Jovi's songs are ones that work really well on stage. They're so up beat and lively that they get everyone in the spirit of things.